The Catholic Bears were in no mood to lose their home-court advantage again. 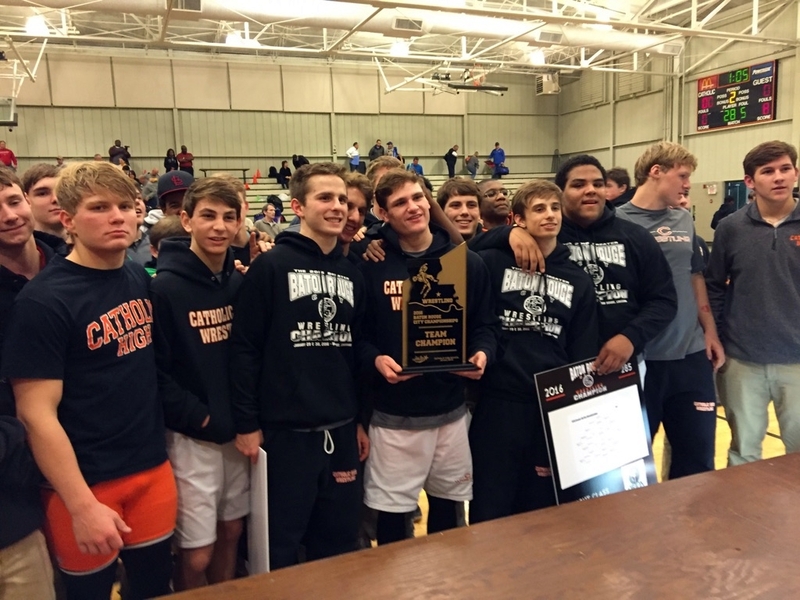 The 2017 Greater Baton Rouge Championships will be held at Catholic, just as they were on Friday and Saturday when the Bears won their 27th city championship. Cameron Carpenter (120 lbs. ), Davis Polito (138 lbs. ), Jacob Fereday (160 lbs.) and K.J. Wilson (285 lbs.) won titles for the Bears, who scored 263 points. Live Oak, just as they did in 2016, placed third after accumulating 172 points. McKinley, Brusly and Dutchtown placed 4th, 5th and 6th, respectively. Other title winners were Central's Austin Gouedy (106 lbs. - his second GBRC title), Live Oak's Ean Hill (126 lbs.) and Brennan Webb (145 lbs. ), Brusly's Austin Franklin (132 lbs. ), Kennan Tate of Zachary (195 lbs.) and Mason Rabel of Dunham (220 lbs.). As expected Airline High School, the host school for the LHSAA State Wrestling Championships next month in Bossier City, handily won the North Louisiana Regional Championships, held on Saturday at North Desoto High School. The Vikings scored 205.5 points, far outpacing host and runner-up North Desoto's 141 points. The Vikings took home five individual championships by Tucker Almond at 113 lbs., Javarious Jones at 126 lbs., Kyler Barringer at 138 lbs., Antonio Lococo at 145 lbs. and Christian Walden at 160 lbs. 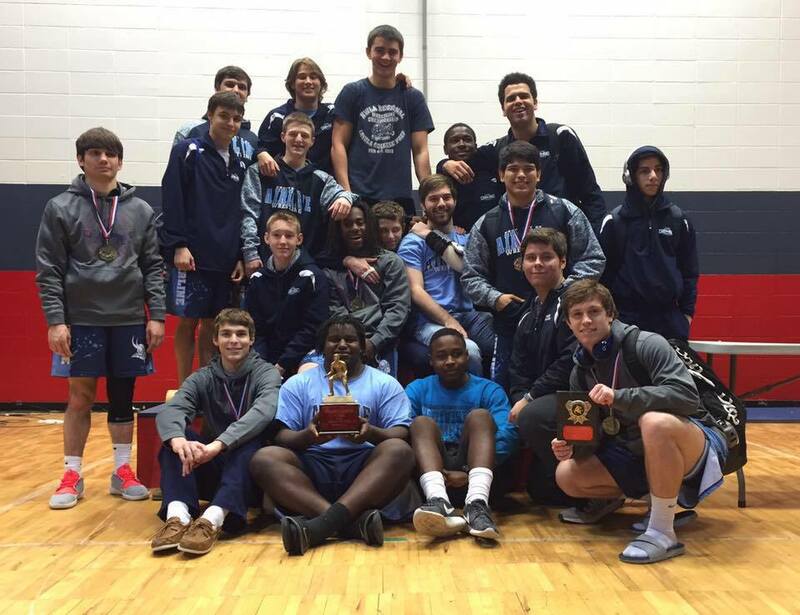 Airline also had two runners-up, two third-place finishers and a fourth-place finisher. North Desoto had three champions in Chase Bates (132 lbs. ), J.R. Davin (182 lbs.) and Justin Gaskin (195 lbs.). Bates and Walden were voted the tournament's Outstanding Wrestlers. C.E. Byrd finished in 3rd place and had a champion in Clay Celli at 106 lbs. Parkway's Nathan Pitts won the 152 lbs. championship for the fourth-place Panthers. Fifth-place Haughton had two champions: Dylan Holliday at 120 lbs. and Johnny Vanveckhoven at 220 lbs. Huntington's D'Anta Anderson won at 170 lbs. and the 285 lbs. championship went to Evangel's Joseph Priestley. Teurlings Catholic welcomed back three-time defending Division II state champion Brock Bonin to the Rebel line-up, and he did not disappoint. Bonin won the 138 lbs. championship on Saturday at Northside High School. Joining Bonin with championships for the Rebels, who won the event with 209 points, were Trey Hebert at 145 lbs. and Kynan Sonnier at 195 lbs. Rayne was the team runner-up and Tyler Carriere (170 lbs.) and Devonte Robinson (182 lbs.) took home titles for the Wolves. The third-place North Vermillion Patriots won titles at 113 lbs. with Gavin Becker and 145 lbs. with Brennen Landry. Fourth-place Basile had two champions in Gavin Christ at 120 lbs. and Isaac Cortez at 132 lbs. A somewhat depleted Comeaux team placed fifth, but nevertheless had two champions in Blake Menard at 106 lbs. and Dyllon Bernard at 126 lbs. Other weight class winners were Rodrigo Diaz (220 lbs.) and Dominique Williams (285 lbs.) from Lafayette, and Trae Case from Kaplan at 160 lbs. Lafayette's Dominique Williams was voted the tournament Outstanding Wrestler. Sulphur won their first Jesse James Southwest Shootout, held Saturday at Sulphur High School, over teams from the Lake Charles area, scoring 113 points. St. Louis Catholic was right behind the Golden Tornadoes with 104 points.